Question: What did you eat this year that you will never forget? What went into your mouth & touched your soul? 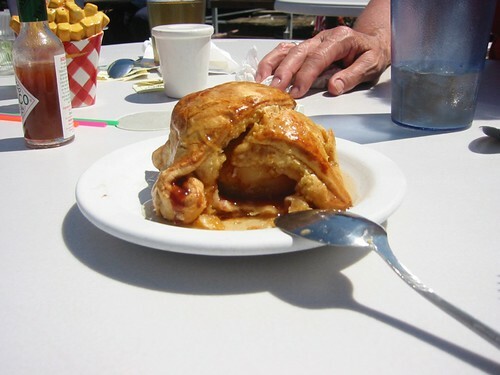 Answer: The apple dumpling I had in July, in Seabeck, WA at Barbie’s, with my mom, uncle, and cousin. It was a perfect day, eating in the warm, scenic outdoors with loved ones who I rarely see. The dessert was a fantastic pleasure to the eyes (and hands- it was heavy!) as well as to the palate. Before we sat down for the preceding lunch, I’d spied it on the front counter and fallen in visual rapture. I’d never seen such an apple dessert: a cored apple was in the center, with a generous helping of cinnamon and brown sugar, wrapped in pastry. Drizzled with a caramel sauce. It was the essence of dessert: celebratory, sizable, and delicious. The fruit filling, even though apple, felt appropriate for summer, perhaps due to the fact that we were in the State of Apples. Bonus: Steve and I received a cookbook for Christmas, that appears to have the recipe! This was today’s Reverb10-inspired post. I’ve missed a few, due to internet-weak (but soul-strong) travels in the Pacific Northwest.